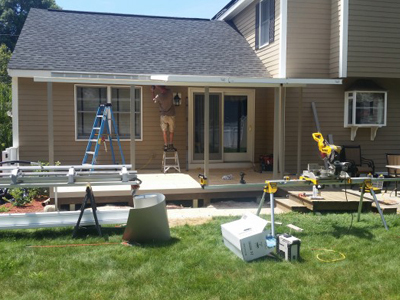 The Clearview Sunroom & Window installers are busy on the job in Methuen, MA. The project – installation of a Dura-Built roof system with PGT Eze-Breeze Vertical 4 Track windows. Clearview crews replaced existing concrete footings with new ones to support the existing deck before the new system was installed. Check back in over the next few days for updates as we start to wrap up the project! Call us at 603-750-7577 for more information. Four Seasons – Model 230 Sun & Stars Cathedral? Happy Lollipop Day From your friends at Clearview Sunroom & Window!!! !